Nothing looks and feels more comfortable and naturally beautiful than Wood Furniture on the outdoor patio or deck and in the garden. 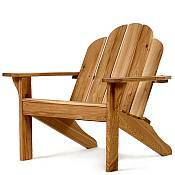 All of the Oak Patio Furniture we offer is constructed from Chinese Oak, which is a dense hardwood similar to teak. Like teak, Chinese Oak has the natural ability to resist insect infestation and mildew, reducing the amount of maintenance required season after season. Unlike teak, Chinese Oak is more readily available and much more affordable. Chinese Oak is even harder than Red Oak, which means that it is exceptionally durable and can withstand harsh weather conditions for many years. The Chinese Oak used for our Oak Patio Furniture has been kiln dried, which virtually eliminates warping or cupping after years of exposure in the outdoors. Each piece of furniture is stained with a light oil for additional weatherproofing, and this also gives a uniform appearance to the wood. Each piece is constructed with mortise and tenon joinery using Swedish exterior grade Casco Nobel glue. Solid brass fittings with high quality fasteners give superior holding strength. Please see more information about Caring for and Maintaining Outdoor Wood Furniture in this helpful article. Click any link or photo below to learn more about the Oak tables, chairs, benches, and ottomans we offer.